Welcome to the Recovery International Chatroom! ** This chat room is open 24 hours a day. A schedule of structured meetings and moderated chats is at the bottom of this page. The purpose of the chatroom is to provide peer support using the principles of Abraham Low’s self help system. 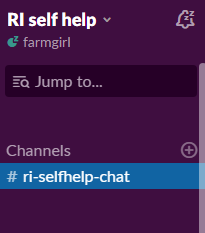 If you are new to the RI chat, please send an email to meetingleaders@RIselfhelp.com to request a signin to Slack. It should not take more than a day to get you signed up. If you have participated in the chats before and received an email from Gus on or around 4/18/2019 then you have already been invited to join Slack and can go ahead and log in. All meetings will be held as usual at the posted times. Check the links on the right: these will help you with the background information on Recovery International, sample spots, and a sample “Example” in four parts. Please note: this chat software works on desktops and tablets AND phones! You need to download the Slack app (free) to your phone. ** The official Recovery International web site’s chatroom is temporarily down and so this chat room will be used until the new web site has launched a new software.